But now, tournaments are moving to Asia, and the women’s tour will even hold its year-end championship in Singapore. Meanwhile, Li has more than 20 million followers on a Chinese social media account. And numbers vary on this, but the China Tennis Association said in 2011 that 30 million Chinese were regular tennis players, up from just two million six years earlier. The truth is, tennis needs to add a fifth major and put it somewhere in China. It’s not that easy for the NBA to just drop a team in Beijing and travel for games against Cleveland and Detroit. Tennis has built-in advantages as an international sport. It might have found a frontier. Li took the sport there. On Saturday? Well, nothing in sport sells like compelling competition. That’s not what we got. This wasn’t much of a match. Both players were too nervous in the first set, and Li couldn’t figure out how to get her forehand onto the court. In the second set, Li calmed down, crushed backhands and rolled. She has the best backhand in women’s tennis, and will now move up to No. 3 in the rankings. So the day was a big victory for tennis. A dream day. It was a big day for women’s sports in general, too. It might have something to do with having a daughter, but I tend to look at these tennis major finals as rare opportunities for women’s sports. Tennis is the one women’s sport that has made it to the mainstream regularly, not just in Olympic years. There are four BIG days a year in tennis, four spotlight moments for women’s sport. I took criticism last year when I wrote from Wimbledon that the women’s final was a lost moment. Here’s the proof I was right: Ask 10 non-tennis sports-fan friends if they remember which woman won Wimbledon last year. If you’re in the U.S., a high-spending sports market, you’ll find the number of correct answers to be somewhere in the range of. . . It was Marion Bartoli. She beat Sabine Lisicki, who had beaten Serena Williams earlier in the tournament. Lisicki fell apart in the match. Bartoli plays an unorthodox style that isn’t fluid or pleasant to watch. And on top of that, she doesn’t have supermodel looks, which – being honest – is one thing that can sell in the U.S. That’s not fair, but it’s fact. Bartoli was a great personal story of individuality. She had always done everything her way. She fought the tennis federation in her own country, France, over the right to choose her coach. She fought with her father publicly. And no tennis academy today would have even allowed her to keep those awkward strokes when she was growing up. Yet there she was, using them to win Wimbledon. So her message was a great one. It also was one that didn’t sell, not in the U.S. anyway. And then Bartoli retired. On Saturday, even without a high level of play, that Li-Cibulkova match sold BIG. Li is also a lesson in individuality, by the way. She fought the Chinese federation, which was insisting on telling her who her coach would be, and what her practice and travel schedule would be. It also took 60 percent of her earnings. It was crushing her. And if that had continued, who knows if Li would have reached the heights she has gotten to? She fought back, and won. At the 2011 French, she had her own coach, her own schedule. She had taken control of herself. And she said China had agreed to take only 12 percent of her earnings. 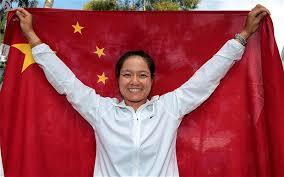 At the 2011 Australian Open – before Li won her first major — I talked to a female reporter from China, who I sat next to every day. I asked how her country saw tennis and why it didn’t draw crowds. I suspect it’s more than that now. Li represents the next generation in China, too, appeals to younger people. She is a strong, young woman who goes her own way, has tattoos and speaks her mind. And now, two major championships. She’s rich. And we were lucky to find her. This entry was posted on Saturday, January 25th, 2014 at 8:16 pm	and tagged with Australian Open, Dominika Cibulkova, Li Na, Serena Williams and posted in Australian Open, Li Na. You can follow any responses to this entry through the RSS 2.0 feed.